Android based smartphones and tablet PCs are in growing trend and if you wonder what other mobile segments that will able to benefit from this open source OS, Archos’s recently announced PMPs (Portable Media Players) may give you some hints. Modeled as 28 and 32, there are also dubbed as tiny internet tablets with 2.8-inch and 3.2-inch capacitive LCD touch screen respectively. 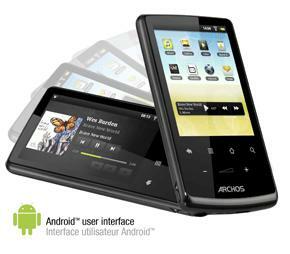 With Android 2.2 Froyo OS running on Archos PMP, users can expect a totally different visual and audio multimedia experiences as compared to conventional MP3/MP4 players. Preloaded with its built-in music app called Music Cover Carrousel, users can easily browse and discover more music with easy media controls. Besides, it is enhanced with social networking capabilities such as Ebuddy, Facebook, Twitter and users can stay connected to internet with its 802.11b/g/n WiFi wireless technology and Bluetooth connectivity. Furthermore, its built-in 3D open GL accelerator allows a much smoother 3D games and video playback while moving around. In terms of capacity, users will option to either choose 4GB or 8GB for Archos 28 or only 8GB for Archos 32. As you may thought that the next generation PMPs could be quite pricey due to its advanced wireless feature with additional features support, surprisingly they can hit $100 price point with $99.99 and $149.99 for Archos 28 and 32 respectively.